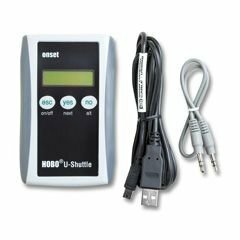 The pocket-sized Shuttle provides a convenient way to readout and relaunch many of the HOBO data loggers and bring the data back to your host PC. The HOBO Shuttle works with the HOBO U-series loggers and HOBO Weather Stations and Micro Weather Stations. The HOBO U Shuttle Data Transporter works with the HOBO U9 Logger Family, HOBO U10 Logger Family, HOBO U11 3 State/1 Event Data Logger, and U12 Logger Family. The U-Shuttle is also compatible with the HOBO Weather Station and HOBO Micro Weather Station.